Did you miss the preshow lecture last Friday evening? Shakespearean scholar Dr. Michael Best, also a Professor Emeritus in the Department of English and the Founder and Coordinating Editor of Internet Shakespeare Editions talked about the history of how playwrights reinvented and recycled play material in the past and places Charles Marowitz's reinterpretation into this historical context. Tune in and listen now! Friday's lecture was recorded and the audio file is now posted on our website. 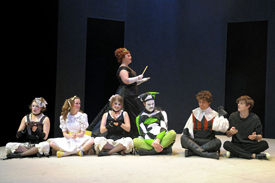 See some of the fun costumes and action happening during The Marowitz Hamlet with the photos (by David Lowes) and funky/creepy video (by student Jess Knowles) now posted online. And remember that you can check out photos from over ten years of our past plays on our website under play archive. Enjoy! In the press: "It will mess with your head a little." "I thought I knew what to expect, but it's much more clever than that. It's sort of like a Hamlet remix... What I wasn't expecting was Hamlet - sort of like an M.C Escher drawing. There's no gravity, what's up is down, you never know which way's which. ... It's like Hamlet on acid. It's not the audience that's tripping, it's the title character himself... [Audiences] will be entertained. I was. There's no denying the audacious brilliance of how Marowitz pulls it off... It's quite well acted.... The play looks good, there are some inventive set pieces. ... Michelle Lo's costumes are fun; each character is from a different time, a different place....If you love Hamlet and know it inside out, The Marowitz Hamlet is lots of fun." Check out David Lennam's review of The Marowitz Hamlet on CBC On the Island with host Gregor Craigie from this past Monday morning. "It will mess with your head a little. ... the restraint and professionalism of the Marowitz Hamlet ... fits the stage with the class and authority of a well-tailored tuxedo." "Marowitz accomplishes his drastic shortening of the five-act Elizabethan brick [now only 75 minutes long] by inter-cutting scenes, characters and relationships with one another. Hamlet’s famous chastising of Ophelia alternates with him chewing his mother out over her infidelity. The ghost’s speech both nettles his son into action while praising the virtues of his sober foil Fortinbras. 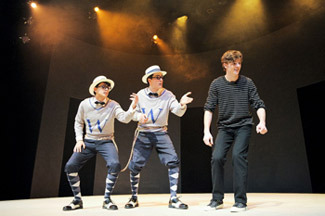 Naturally, the hammy Rosencrantz and Guildenstern (Jonathan Mason and Kieran Wilson) – literally joined at the hip in this staging – find themselves in a mid-conversation tug-o-war between their friend and benefactors." 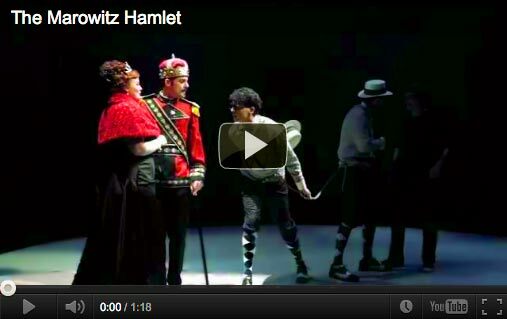 "As Marowitz notes: “Hamlet takes place in Hamlet,” and it shows. Few plays feel so stream-of-consciousness. The pacing is rapid and structure fluid.... I’ve already recommended this to my theatrely friends and my writerly friends..."
Read more of Chris Felling's review in Culture Vulture Victoria.